Docile: Docile mobs are peaceful and will not attack you. These mobs are typically farm animals, will run away if attacked, and can typically reproduce. Neutral: Neutral mobs will not attack you unless elicited; if you leave these creatures alone, they will return the favor. Hostile (also known as Monsters): Hostile mobs will attack you without being prompted. Players must defeat these mobs or try to avoid confrontation by staying far away from monsters. Discover the most common types of each mob below and see what each mob does. 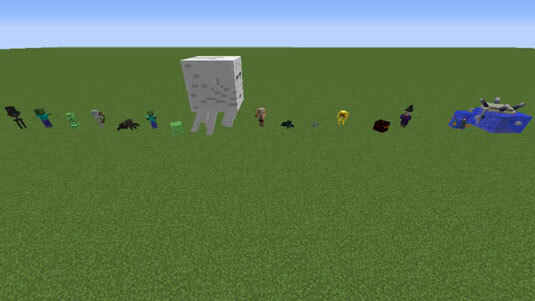 Some mobs will provide protection, others will be aggressive to other types of mobs, and some will even try to attack you – see the full list of Minecraft mobs below. Some mobs in Minecraft are docile: They can’t harm you, and they won’t try. 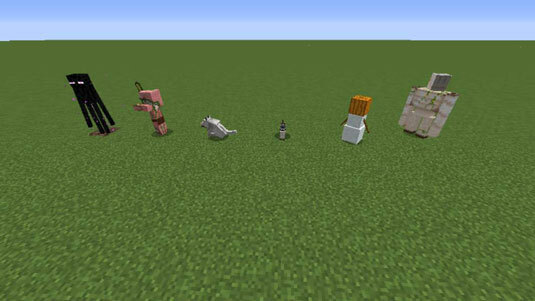 All land-based docile mobs (such as pigs, cows, sheep, chickens, ocelots, villagers, and mooshrooms) flee when attacked. You can lure cows and sheep anywhere around the game by holding wheat, and you can right-click two animals of the same species while holding wheat to feed them and cause them to spawn a baby animal. Chickens and pigs have this same faculty, but they require seeds for chickens and carrots for pigs instead of wheat. on the underside of blocks. picked up. It incurs no damage from falling. Cow The common cow provides useful loot, and it can be bred. holding a bowl to create mushroom stew. an ocelot five times or so to tame it. move to the overworld through a nether portal you create. Sheep The common sheep can be used to obtain wool and food. 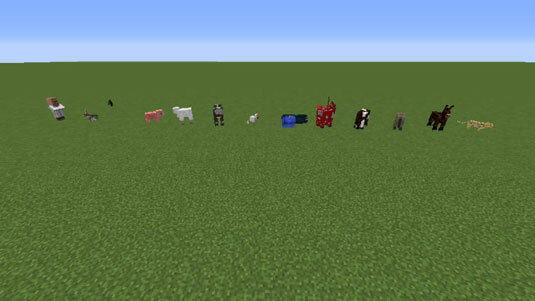 wool; right-click a sheep while holding dye to recolor the sheep. can swim, and it dies if it has no water to breathe. and have children. They can also trade with players. horse has a unique combination of speed and jumping ability. Offspring average the speed and jumping ability of their parents. sugar, hay, wheat, golden carrots, golden apples, and apples. inventory, which stores their equipment such as saddles and armor. Some mobs are neutral, leaving you alone until you provoke them. Minecraft has only a few neutral mobs, and some of them can become allied and fight alongside you, as described in the table. Cat A cat, which is a tamed ocelot, can follow you around. it sit or follow you. It can be bred like certain passive mobs. or when built by the player.